The Psychologists clearly spell out Ten Benefits in rearing a pet: While the primary benefits to animals are obvious – to place them in loving homes and keep them from being destroyed – the benefits to elderly persons are ten-fold (versus non-pet owners). You, readers may just wonder ‘What! pets and Vedanta! I was pleased when Skendha Singh from New Delhi, India commented that ‘pets seem to gravitate towards our places or seats of meditation’. It is so true! 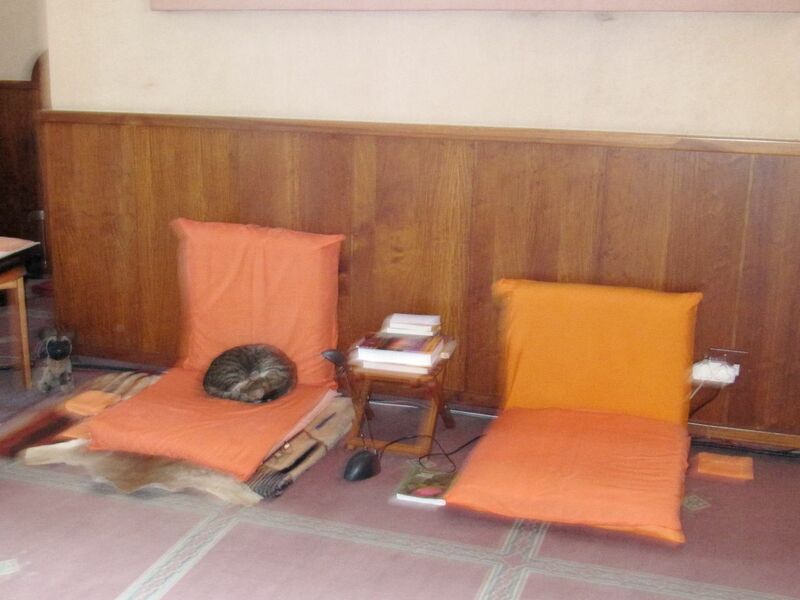 In our Ashram, we have now two pet cats – Kripa and Satwik. Both of them never leave the campus and are fond of being present in the Temple during mangalarati time as well as evening arati time. Yes, one of the pancha shanti mantra (the famous five peace chants) – tacchaiyn yora vrineemahe – loudly proclaim ‘shanno astu dwipade, sham chatushpade’ “May there be peace to humanity; may peace be to animals” goes back to the ancient Vedic times from when we, the Hindus have inherited the wonderful feeling to take care of not only the ‘two-legged’ but also the ‘four-legged’ ones. Our mythology is abound with creatures beloved to Gods and Goddesses. While Ganesha is fond of His mouse, His brother Murugan delights with peacock. Shiva’s favourite is bull, while Vishnu prides in eagle. Durga’s lion is well-known. Krishna had lovable calves and cows. Shiva’s servant Bhairav has dogs. Among the beasts and birds, dog as a pet has become the most favoured species among the men and women all over the world. Saints are not excepted. Swami Vivekananda had a dog called Bagha who had been a stray mongrel and picked up from the street as a puppy. This dog became so close to Swamiji that once Swamiji had to caution the monks in Belur Math not to harass him anytime. On the day Swamiji’s body was cremated, Bagha remained close to the funeral pyre and wouldn’t move; he was so overwhelmed by grief that he stayed there for a long time. No one could make him eat or drink on that day! When shall we develop that dogged attitude of dedicating our life at the Master’s feet and lay there to do His bidding? When shall we acquire the ‘pet’-sense of sharanaagati – ‘surrender’? Next Post: Be like a Bee! You always have these extraordinary ways of explaining things. How your article started off showing the practical side to pets and then moving to the religious examples of them. And the examples are wonderful. I would have never associated the attitude of a pet to our attitude to the Master. It is a very good example. It was joyful to read your kind comment. Yes, you have accurately brought out in brief what I imagined originally as I was wondering whether my thought-flow could depict exactly. The lives of Direct Disciples are indeed practical guide in spirituality. It is wonderful how they could turn the most seemingly ordinary instances into a valuable aid in the process of transformation. I hope you are, in your spare time, reading Revered Swami Chetananandaji’s enthralling book God Lived with Them. May master guide you is my prayer! 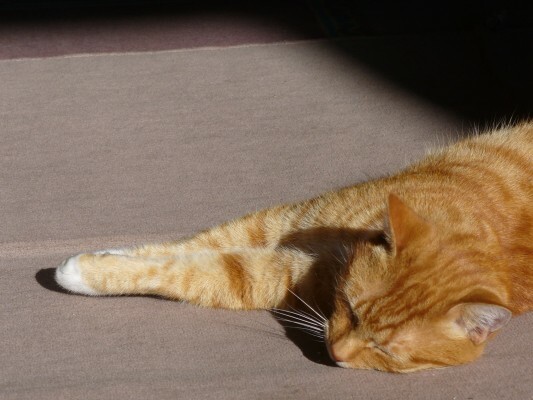 We once had a cat who used to like to sit beneath my mother’s chair in our home prayer room while she (mother not the cat!) meditated! Just today I was horrified to read cruelty to a pet dog here. Man can go to the extent of taking ‘revenge’ on an animal ! Oh! I shuddered to think what a mental trauma that was inflicted on this poor creature. Kindness to animals is a sign of spiritual maturity. At Ranchi we had one Ashram dog called ‘Yogi’. Whenever anyone especially the other monks ‘scold’ him for his alleged wrong-doings, he would simply run to me and hide himself behind my feet! He would speak thru his eyes! At Along centre, once Swami Suviranandaji told me that one big bee was tapping on his door frequently and he came out. It started flying in the direction of Rose Garden. The Swami followed it. Instinctively he knew that the Bee is trying to convey him something. Exactly so. When he reached the Honey Box site, he saw that the box was jammed by millions of black ants which were harming the bees inside. He cleared the site with servants help to the great delight of Bees! May Ma Sarada bless you with intense feeling! You have such a wonderful way of describing anything and everything in one’s life. I really like the analogy of the pets and spirituality and Master. Pets are so nice to have. 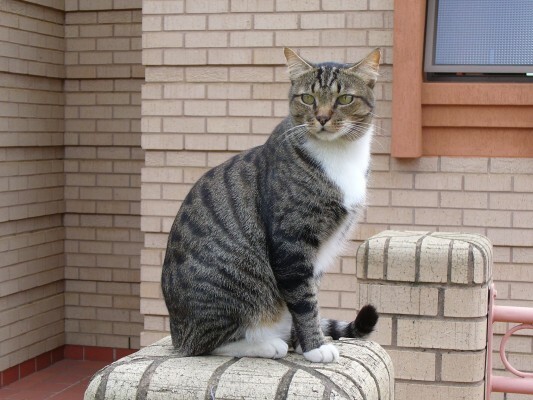 At my home in SA we have a cat, Astro, who is very much a part of the family. Honestly, I like to keep a fish tank. What I cannot tolerate is when people abuse and don’t take proper care of animals. The Ashram cats are so cute and playful. I really like the pictures on the blogsite! You know, on man and pets, they say that Dog is man’s best friend! Thanks for your visit and comment. Yes, I do fully agree with you that not taking proper care of animals is indeed abuse. In Ranchi during the last three years we had 2 Alsatian cross dogs to guard our Dairy farm. They were pets to monks. Any monk in the ochre robe was dear to them. They would simply come and lick the toes (I would call this as a sign of making ‘pranam’!) and be happy to move with. I named them as Vaali and Sugriv of the famed Ramayana. Yes, dogs are grateful. They can understand their Master. May Mother increase your love for pets! What a wonderful and joy giving post! Kripa and Satwik are beautifully named and their lives may be a cause of serious envy to many human beings! What wonderful impressions they may carry with them! Indeed, Srimat Swami Shivananda‘s quote is deeply inspiring. Here, I remember one more similar instance. Again from Pujya Baburam Maharaj. 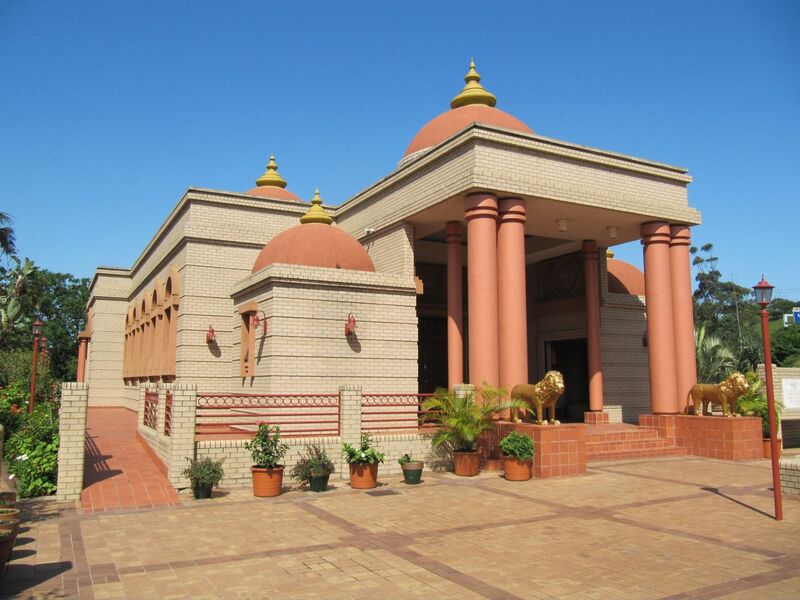 I really enjoyed reading about the incident from your childhood Revered Maharaj! It is true.. that even animals have different natures, as variable as human beings. A Maharaj here at Delhi would urge me to be serious about spiritual life. At this the Maharaj could not desist from laughing! It is amazing what a long and enjoyable conversation this is becoming! Indeed a joyous conversation! I am happy that through this medium we are able to narrate and relish the wonderful reminiscences of the Direct Disciples. Please accept humble pranams at thy feet! This amazing article on pets brought a gush of tears to my eyes. A few years ago my pet Moshino, a beautiful white Maltese passed on. He was my son and my best friend! Moshino never missed our Saturday morning hawans, in fact he used to be in the shrine before me. Sometimes I used to close the shrine door and sit for saadhanaa, Moshino would frantically scratch the door until he was let in, and then he would sit quietly or curl up and fall off to sleep. Somehow he understood the sanctity of the shrine. He loved people, and whenever any devotee from our Ashram used to visit our home, his excitement knew no bounds. I can still remember his eyes. How pleadingly they would say “dont leave me”, when I had to leave home and then his happy, shiny eyes and when I used to return. My memories of Moshino will last a lifetime and I pray that his soul finds peace. Moshino has left an indelible mark on my life. Thank you Maharajji for this beautiful post! Its but natural that you shed tears for your Moshino. Yes, when you showed his photo, I could imagine how much lovable he was to everyone of you in your family! The parting by death is painful and I understand why you have not had any other pet after he has gone. A pet is like one’s own offspring. May Mother increase the circumference of your love circle outside the human mind-body complex! Yes! How Sri Ramakrishna saw Mother in the form of a cat and naturally fed or rather offered temple offerings to the cat…and what a fuss that caused! A paramahamsa is capable of seeing God in everything that includes animals too! Seeing God in even man is so difficult for us, ordinary beings…do you remember how He shouted one day to Hriday, calling him and Hriday ran to Him thinking something has happened and lo! Master showed him thousands of ants under a tree and pointing out those ants, He said, “look, I see pure consciousness”! Satwik and Kripa are really blessed souls. Maharajji, today I want to ask you one very important question. I am not able to give up JEALOUSY towards other Devotees, specially seeing their DEVOTION, COMMITMENT and REGULARITY!! After seeing these images of SATWIK and KRIPA again I had the same feeling of jealousy. I also remembered a cat at GANGES ASHRAM OF CHICAGO WHICH HAD PERMISSION TO GO IN SHRINE ALSO! As regards to PETS (specially CATS AND DOGS ARE BEST FRIENDS TO HUMNAN BEINGS) I am mailing you a beautiful image of TWO SUCH FRIENDS!! Yes, indeed the image of your two best friends is beautiful. Let there be jealoIusy! Who cares? All the six enemies kama, krodha, lobha, moha, mada, matsarya cannot be destroyed in full till the body consciousness prevails. So let them stay “thaak shaala daas hoye!” in Master’s words. Instead of having jealousy on other people’s wealth and progress, have jealousy on how much others have devotion and that will goad you to develop yourself. ‘Mod phiriye dao’ must be our mantra! May Master give you the strength to sublimate all mental foes! The religions that don’t accept the theories of karmaphala and rebirth, for them the concept of heaven and hell may carry some meaning. But Sanatan Dharma tells us about karma and resultant rebirth, that if we are good, we are born in shuchinaam srimataam gehe and if we are bad, we are thrown in asuri-yoni in our next births. Now, where does this heaven and hell fit in? When do we go there? If we see Jada Bharat‘s story, it is evident that immediately in his next birth, he was born as a deer. There is no reference anywhere of his having gone to either heaven or hell in the interim period. Can you please clarify my doubt? I really look forward to your answer. Pranam to our Dear Swamijee! This post is truly wonderful guidance for everyday life and its message appeals to all. I find it so fascinating that animals are capable of such divine behaviour. It is quite a co-incidence that we are also thinking of getting a pet and any doubt that I’ve had, has now been banished. I could never know that this simple post on pet could generate such serious interest amongst our devotees! Oh! how many calls I have received so far expressing their desire to adopt pets! Even if one family takes up the responsibility of rearing up a pet, (as you have decided), I should consider that this post has been well rewarded! And how much the little daughter of yours, my dearestKimaya would love a companion, you know! Tell her that her naanaa-swamiji wants the pet to be taken care of! May Master’s blessings be with all of you! Yes, what a great post! Although i do not have a pet, i do believe animals are sent to us to help us learn and grow, sometimes in difficult times. They seem to know exactly what we need and always understand our needs more than we do. Sometimes behavioral problems in animals are their way of flagging up issues that WE need to address! Pets are an antidote to depression. I also feel that dogs know they are reincarnated. They’re always running and wagging their tails and licking your face and happy as if they were glad to be alive again. Cats, on the other hand, seem to be reincarnated from countries other than our native speaking language! They never listen to what you say or do what you ask of them. So, it’s safe to conclude that cats either do not understand the language being spoken to them, or they are reincarnated teenagers.!!! The horse, I assume, were some sort of athletes in a prior existence; probably in track and field. Thank you for a wonderful post! It surely makes one think. Your ruminations on pets’ reincarnation are indeed thought provoking though you have said everything in jest! Who can say it cannot be! But more important than their previous births, we should be really concerned with their present births as we are all in some way or other inter-connected. The spiritual sense of unity alone can bring about the universal consciousness and hence our striving should be aimed for that. The practical way is to love everyone in this world. Really enjoyed reading through your article. Simple aspects of life have been penned down articulately by you which drives the point home in no time. Every time I read your write-ups, I have this sense of profound calmness descending on me. I agree pets definitely do bring about a noticeable change in one’s thinking pattern and to the way one looks at life, and add an extra dimension which helps one appreciate the fact that life is indeed a gift from Providence. The dedication and peaceful serenity of a pet animal who survives only for the bonding with his master makes one realize that submitting wholeheartedly to the Almighty is the only way to acquire ultimate tranquility, everything else is fleeting and temporary. Hope you are keeping good health. Thanks for your visit and comment. Yes, I know many of our devotees in UAE do read this blog but rarely give any comment. I am happy to learn from Satyajit who recently sent me the annual magazine of the UAE Sarada Ramakrishna Study Circle, that in all three places, devotees’ congregation is steadily improving and I had the news of ensuing Holy Mother Birthday festival too from Shaoni. Yes, faith in Lord is what ultimately counts. May Ma Sarada be with you all! I am a Yuvaka-Sangha member of Bangalore Basavanagudi Math. I happened to read your blog on pets; am very much impressed by your pet-cats at your ashram. True, pets behove us in attaining our spiritual goals. I too have a dog, Richi by name, who always puts forth unconditional love towards his family. He expects to be taken out very often for walking, and demands from us whatever he likes – chapati, egg, churmuri etc. How wonderful these animals are! I remember reading Most Revered Yatishwaranandaji‘s statement that animals follow their nature unswervingly. Henceforth, I will be a regular reader of your blog. Welcome to this blog and may this New Year bring you more love to these dumb creatures who can express their love without words. Que alegrìa inmensa me ha dado el leer este arículo, no solo por tan extraordinaria sensibilidad expresandose libremente, la aguda observación y las enseñanzas, así como los ejemplos, nos permiten abrirnos a la comprensión del “que todo es” Uno”. Tengo un profundo respeto por toda la naturaleza y encontrar seres que comparten lo miismo es una bendición para mi..
That has given me immense joy to read this printed article, not only for freely expressing themselves as extraordinary sensitivity, keen observation and teachings and examples, let us open ourselves to understanding the “everything is One”. I have a deep respect for nature and all beings find it miismo sharing is a blessing for me .. Thanks for your visit to this site! Your appreciation is warmly welcomed! I am happy indeed to learn that you have deep respect for nature and all beings. Peace be to two legged; and peace be to four legged also. The same Divine principle is pervading every thing in this Universe. May you realise this “oneness” is my prayer! Aum, thank you for the lovely article on pets! I work at the SPCA and I witness daily the cruelty people inflict on defenceless animals. Most of the cases are so serious and delibrate acts of cruelty that the press will not print the article, or photographs. I still have vivid memories of cases that i was personally involved in from 10 to 15 years ago. The cruelty cases have increased over the years. The law that protects animals is at most times inadequate for prosecution and conviction. The problem is that it is far too easy to acquire a pet and then neglect it. Animals are sentient beings which most people fail to realise. Welcome Roshan for your wise observation! Yes it is true that acquiring a pet is indeed very easy. But later on taking care of it becomes tedious and finally cruelty is meted out to that innocent jiva. Rectifying the present horrible situation is too difficult but we can all with concerted efforts avoid creating such situations in future. Thats why children are to be taught how to love these pets. The spiritual oneness with these pets must be dinned into their ears so often. Then the future is taken care of. I tell the children coming into our ashrama to hold the cat Kripa in their hands. Though the children initially look afraid but by my repeated promptings and assurance, they take Kripa in their hands and lo! they are so happy!